Rowdy, loud guests in neighbouring room ruin birthday celebration stay. Gold floor disappoints at lack of enforcement to control these guests in room and in hallways. We expected much better staying on Gold Floor! 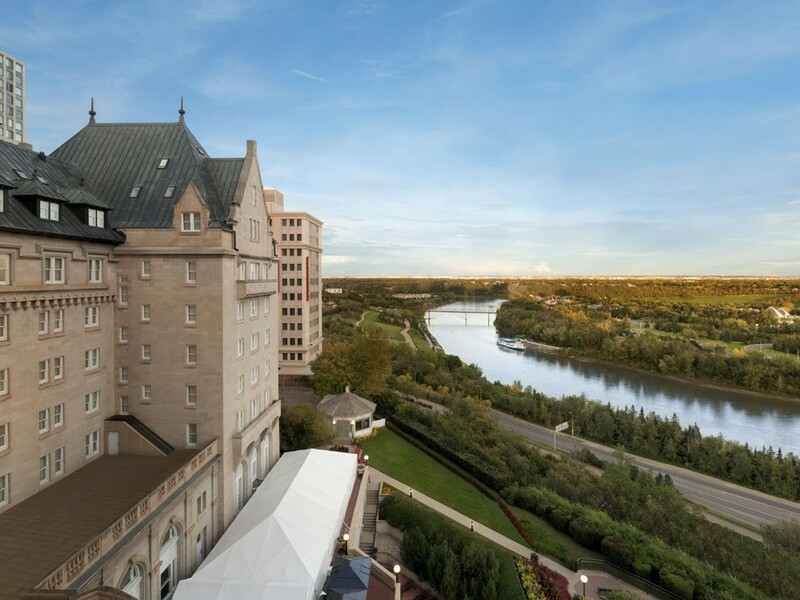 The Fairmont Macdonald is an historic experience. Fairmont has taken great care in preserving the historical attributes of this grand hotel. From the coved ceilings to the iron works in the lobby doors, the past glory is reminiscent. The rooms are very comfortable with all the modern amenities you would expect from Fairmont. Our stay was excellent. you took care of me! Everyone was extremely kind and helpful....although I would have liked the hotel dog to have become more attached to me! I love hotel dogs and I could see everyone loved having him around. Positive experience in each area - bell staff, Confederation Lounge, fitness facility - but could stand to see a bit more focus on the guest at the front desk. With my last few stays, I've noticed the front desk staff are often in discussion with each other and slow to recognize an approaching guest. Given past experience where it feels like a guest entrance is highly anticipated, the bar has been set high. Unfortunately, although when they do take notice, they are quite engaging; it feels less welcoming than it could have been or that I've experienced in the past. Once you set expectations high with consistently exemplary service, you need to continue to delight. Great, but a few things could be better. Pretty sure room was not upgraded? I believe as a platinum member it is supposed to be. Points have not yet posted to my Accor account, this is not the first time. My daughter got A really rotten egg in the club lounge, but everything else in the lounge was great. Also no free drink coupons, am I doing something wrong? This is the third Fairmont I have stayed at where Plat benefits were not provided. We enjoyed lunch in your restaurant, very tasty. We stayed on the 7th floor and enjoyed the snacks and breakfast in the VIP lounge. The car service was appreciated, but the hours should be better advertised. Staff were extremely welcoming and friendly. I took advantage of the valet parking but upon checkout it was not on bill so I assumed I paid them when picking up the car the next day which was not the case and caused some confusion. I just handed the valet attendant $50 and thanked him rather than going back to desk to straighten out. the hotel is an historical building, with friendly staff who were very professional and discreet in their service. Room was beautifully and elegantly appointed, with an effort made to showcase the building's history...something about which the staff were very knowledgeable. Food and drink were excellent, and not unreasonably priced, considering that it is a luxury hotel. My new go-to roost when I'm in Edmontoon! The stay was great, staff was extremely friendly. Michael, drove us where we wanted to go and was awesome. Very knowledgeable. He made our experience that much more satisfying. Lovely and exceptional dinner in the dining room. Underwhelmed with the rooms and the comfort of the rooms though realize the hotel is &quot;old&quot;/historical. A LOT of noise in the other rooms and hallways at night. Settled down by 1:00 a.m. Did not expect this for an &quot;upper end&quot; hotel. Probably won't be back sadly. Beautiful hotel with history! Great customer service! Ourselves and our little puppy were made very welcome! We enjoyed the history of hotel and don’t believe you can get that just anywhere. The food at the harvest room was excellent and service was great. Our matress was extremely old. My husband barely got any sleep. You could feel the springs in it and every movement made by one person would disturb the other. When we told the front desk agent about this the next morning he said we should have called to switch rooms. This is not realistic. We were not about to pack all of our belongings to switch rooms at midnight. He eventually gave us free parking but this will definitely prevent us from choosing Fairmont in the future. The service level at this hotel, as are all Fairmonts, was top-notch. Even though our food took over an hour to get to us at the bar because they gave our food to someone else, they corrected the problem immediately by getting us our food ASAP after the bartender realized what had happened. When we got our bill we noticed they didn't charge us for the food. That is the textbook example of how to right a wrong and it's service like that and that attention level to detail that will make us always come back to this hotel while in Edmonton or any other city where Fairmonts are available.